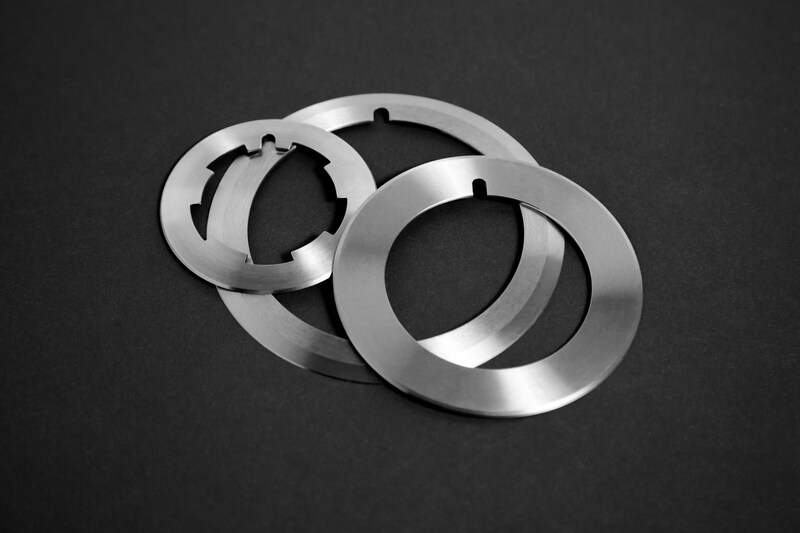 AQS supplies a variety of dished and flat circular slitters. These knives serve the needs of multiple industries, mainly film, paper and foil manufacturers and converters, non woven processing, rubber manufacturing and converting, and other small industries. These slitter blades not only serve many different industries but also have a number of applications as well, all depending on the cut the user is looking for. These cut types include score slitting, shear slitting, and razor slitting. Our range of circular knives are capable of achieving all of these applications. At AQS, we stock many of the top circular knives or male knives in both flat and dished styles with both single and compound bevels available. Our ISO 9002 certified plant has the capability to manufacture the highest quality and to adhere to the tolerance needed by these knives. We also stock slitter knives for a range of OEMs, ready to be shipped out to our customers at a moment’s notice. These OEMs include Tidland knives, Dusenbery knives, Goebel knives, and Arrow knives, just to name a few. All of these slitter blades are made to the exact specifications of the OEM, and our quality on these items is guaranteed for the life of the knife to be free from any defects.